2015 and 2016 were very exciting years, ful of emotions. We delayed to present our achievments, but the wait was wort, because the scope in scientific research and community work, speak for themselves. Here is our progress 2015-2016! Join us on this journey in time remembering 2015 and 2016 ... Slide down. We visited five schools in Cabo Corrientes municipality, and in Mexico City, carrying out environmental education activities. We also carried out this task in two social welfare associations and promoted social awareness about the situation of macaws and their habitats in the region in four different forums. We participated in the summer course 2015 in municipal library Los Mangos, giving an environmental education workshop for one week. We were at Paulo town and visited the elmentary and the high junior schools. 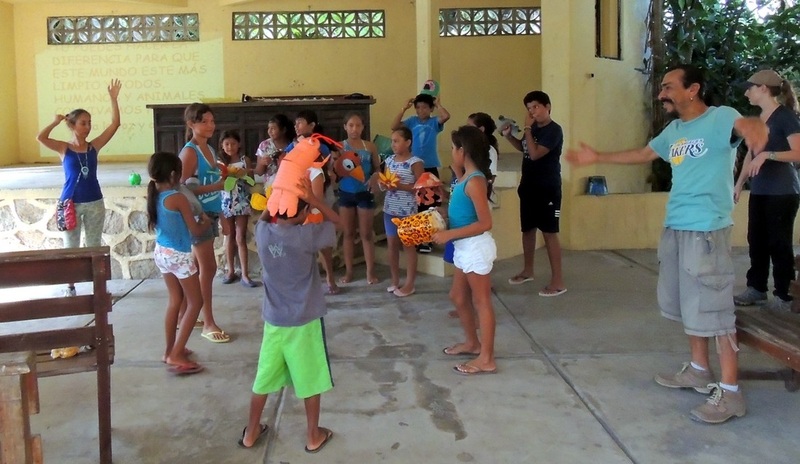 We visited the community center "Entre Amigos" at San Pancho, on the coast of Nayarit. 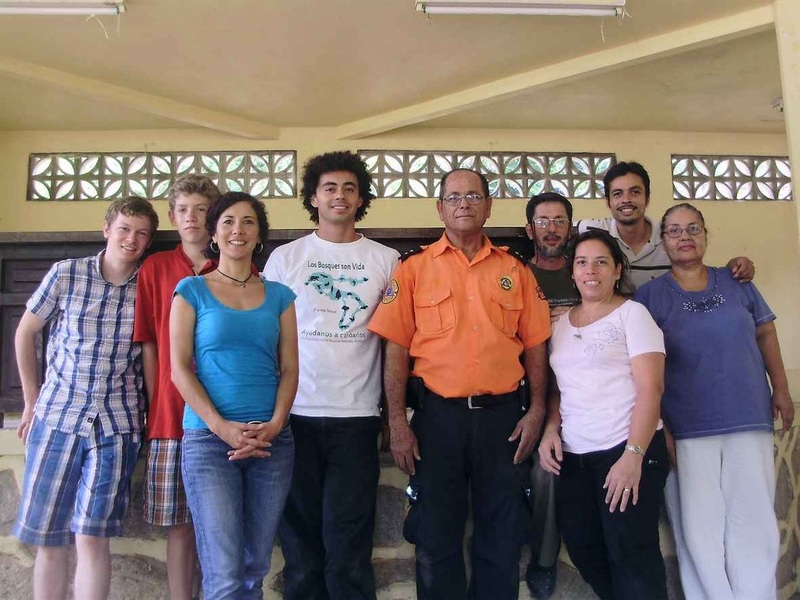 "Arroyo de Esperanza" is a Christian association that does community work in different parts of Bahia de Banderas region. 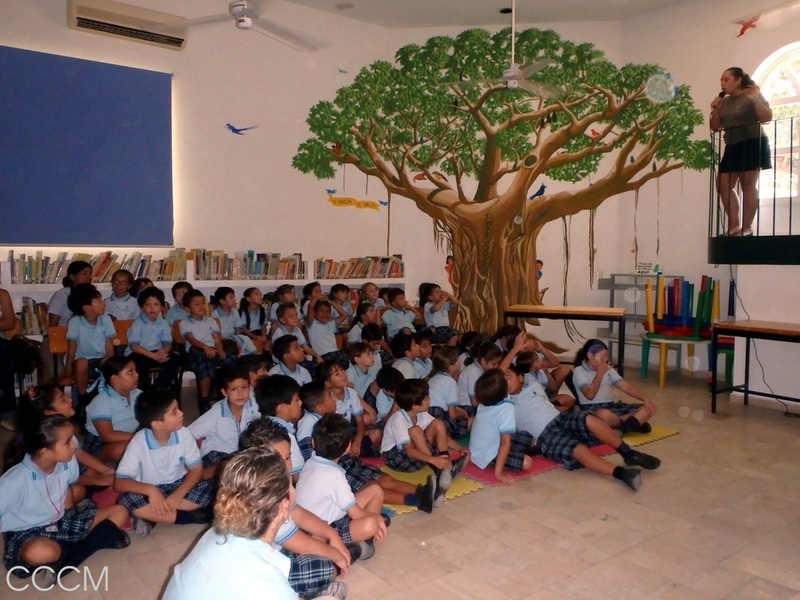 United for the Macaws, overcome its influence area, when invited to give a lecture to José Martí Elementary School in Mexico City. Once again, we visited the Casa Hogar Manos de Amor in Bucerías, Nayarit. 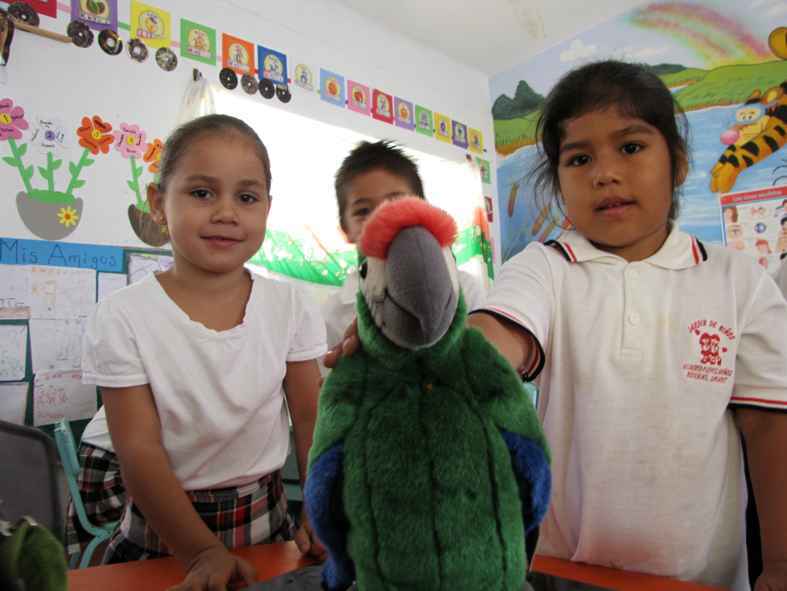 Back to Vallarta, we visited the High junior school at Boca de Tomatlán, to invite the new students to form a working group to protect the macaw and its habitats. Rancho Primavera was visited by a group of Denver surfers on their way to the beach, and invited us to give a talk about our project, so that they learn not only to ride waves, but also about the nature that surrounds them. 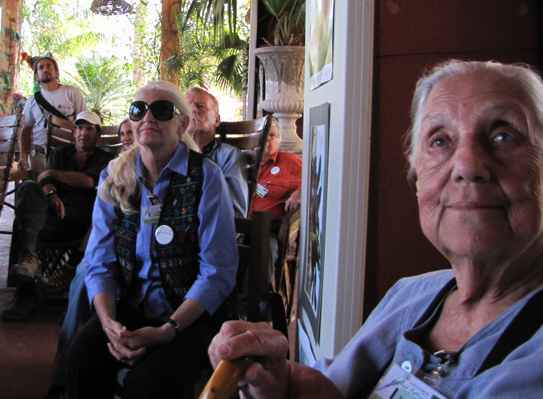 We had the privilege to give a talk to the veterinary community of Puerto Vallarta, now they are our allies in conservation of parrots and macaws in the area. For third consecutive year we had the privilege to participate in the summer course at Los Mangos Library. 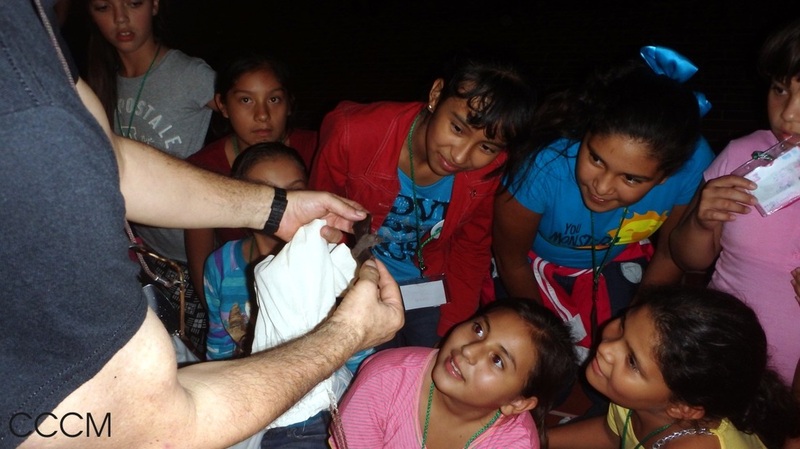 At Expo Kids, we played the nature's lottery and talked about the species with which we share Puerto Vallarta. At this year's animal show, Unidos por las Guacamayas spread its message of why macaws and parrots are not good pets, and how everybody can help protect them. 2015 and 2016 have been our 4th and 5th consecutive year that we have protected the largest breeding area ever found for the Military Macaw. 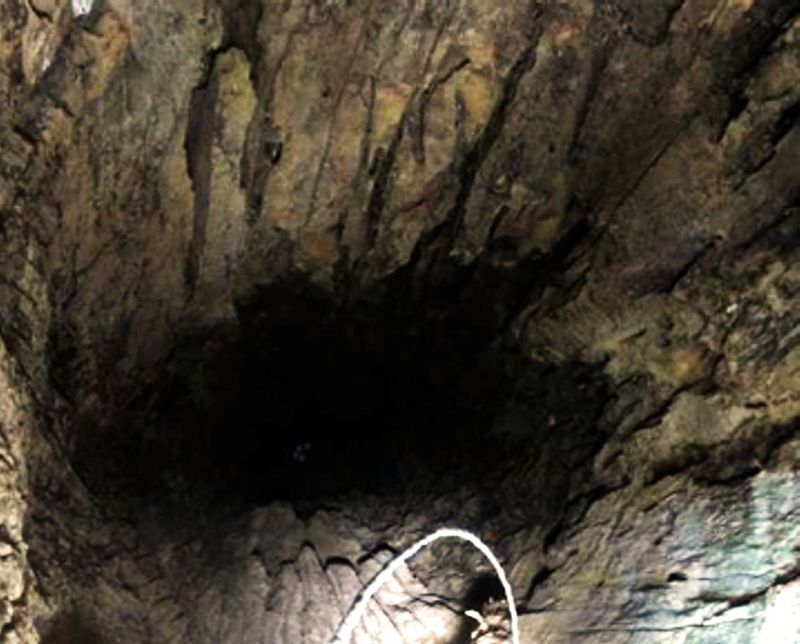 Until now this is our greatest achievement ... and thanks to the exploration effort, we continue to find more nests. In total, 30 nests were protected. 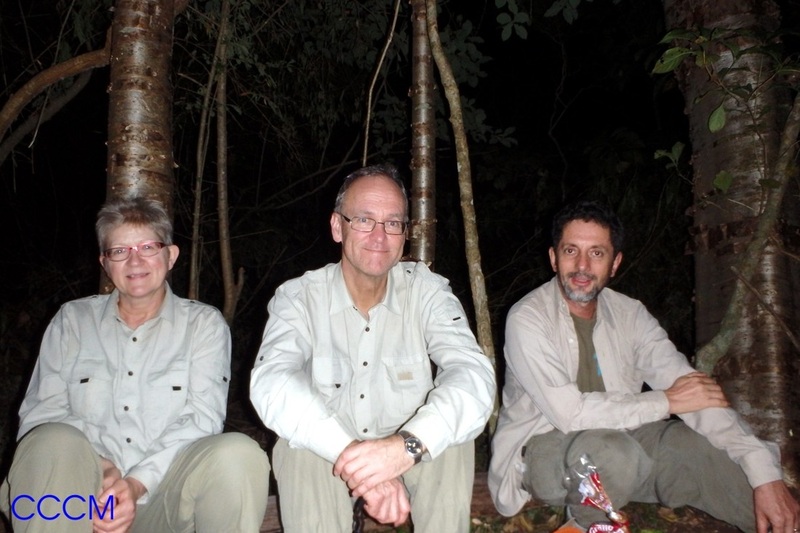 This work has been possible thanks to the participation of our local guides: Javier Sosa and Manuel de Jesús Rodríguez. 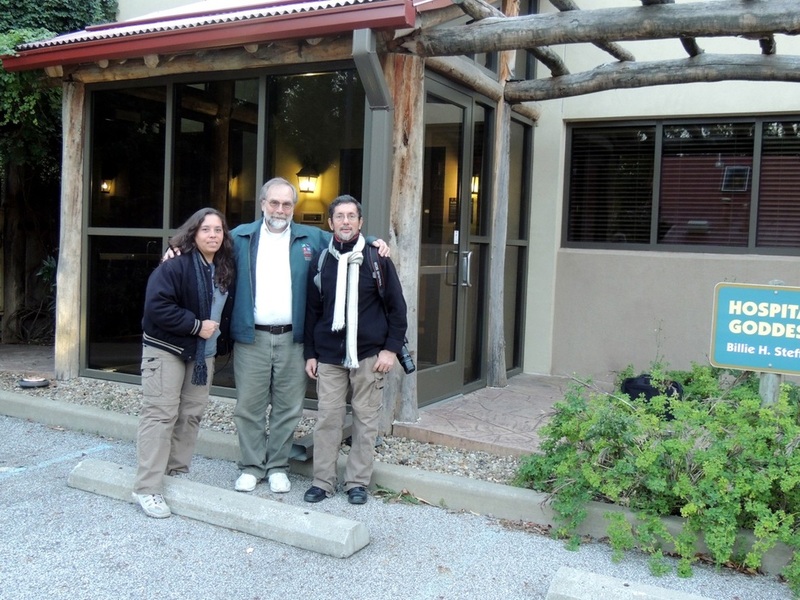 We have received from "Defenders of Wildlife Mexico" the donation of binoculars and telescopes for monitoring. Now our guides already have this valuable tool. With the feathers collected in the field, we began the project of Military Macaw population genetics in Bay of Banderas. 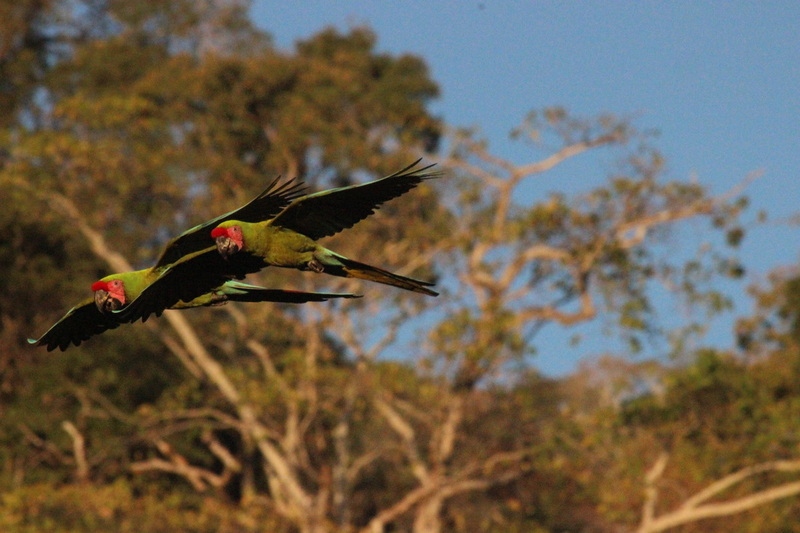 ​We are working to protect the breeding sites of another population's Military Macaw who live in the region. All this work has been made possible by the firm support of Defenders of Wildlife and World Parrot Trust. 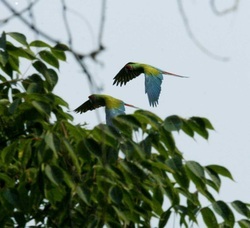 ​Additionally, the study on the floristic characteristics of sites of importance for the Military Macaw in the region is underway. These two research projects are carried out with the support of students from the Michoacan University of San Nicolás de Hidalgo, who will also achieve their academic goals. We have been working with owners of land from 2 different communities, to protect the feeding and resting places of Military Macaw population that is in greater danger in the region. Thus we have completed the study for the area voluntarily dedicated to conservation of approximately 280 hectares, Southwest of El Tuito, in the municipality of Cabo corrientes, which has also served to obtain his degree for a undergraduate student at the University of Michoacan San Nicolás de Hidalgo. ​Since 2016 we have started the first works of two important projects. One is the construction of the first two interpretive trails, one in the middle of the jungle and the other one in an oak-pine forest. It could support economically support to ejidatarios that protect the areas of food and reproduction of the population of Military macaw at greater risk in the region. 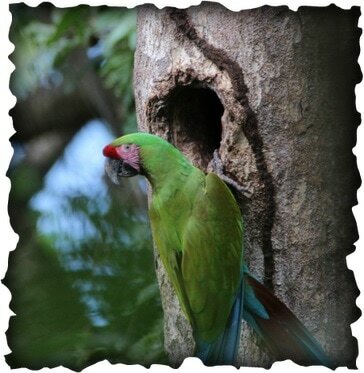 The other project is the implementation of artificial nests for this depleted Military Macaw population and the guarantee of protection of their breeding area. 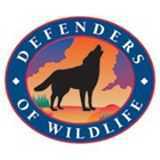 We have the first funds provided by the organization Wldlife Defenders Mexico to whom we extend our thanks. Here is our progress in 2014! Join us in this journey through time remembering last year ... Slide down. During the winter season must of the parrots, parakeets and macaws, are in their reproductive season. 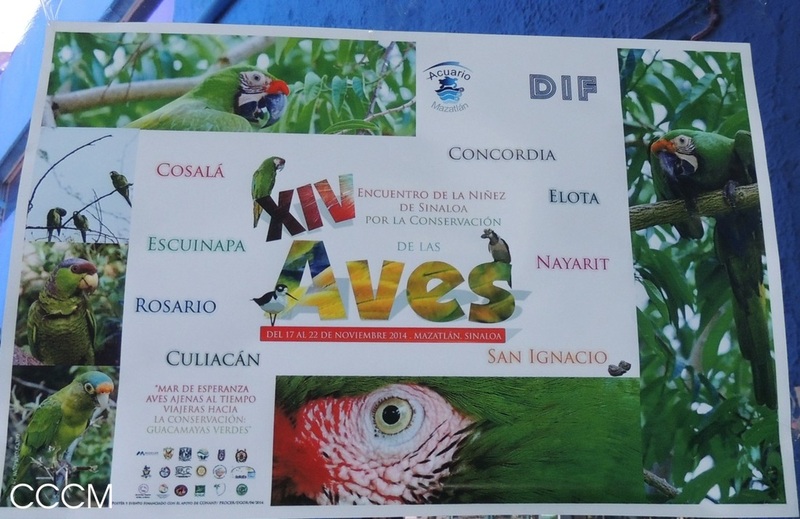 Because of this, The municipality of Puerto Vallarta in coordination with associations like ours, desing a poster that shows the 5 species of parrots that live in the Bahía de Banderas area (Jalisco and Nayarit States). They are protected species by the law and the extraction from their natural environment and their sale is prohibited by laws and considered a federal felony. It is important to learn to identify this species, so when you find animal vendors in the highways you may denounce them. Some of these vendors have special permits to sale some exotic species, so you may be able to identify the ones on this poster. 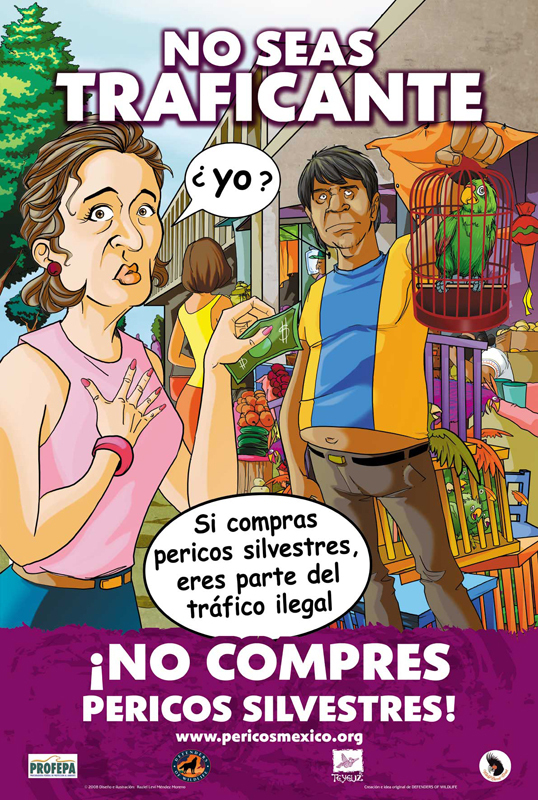 Poster with the support of the Municipality of Puerto Vallarta and collaborative institutions like ours. 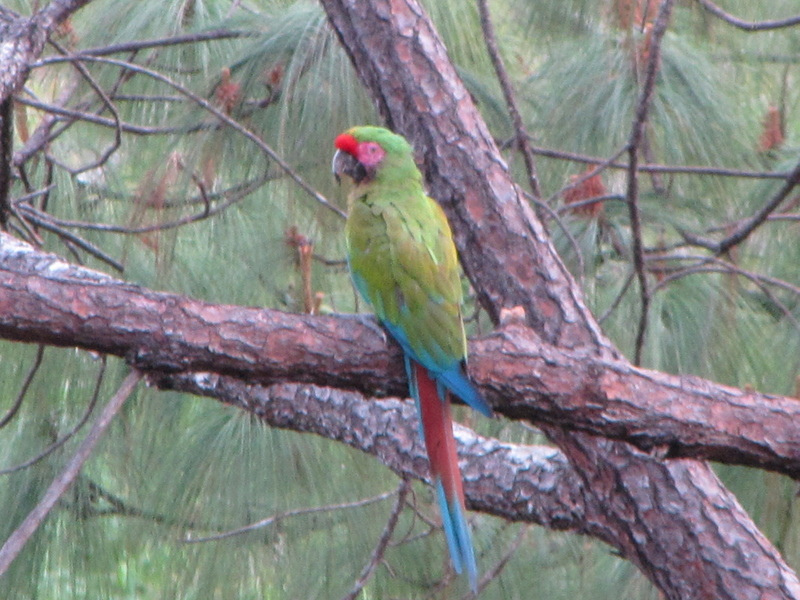 A campaing against illegal traffic of parrots, parakeets and macaws was began in the Bahía de Banderas Area. 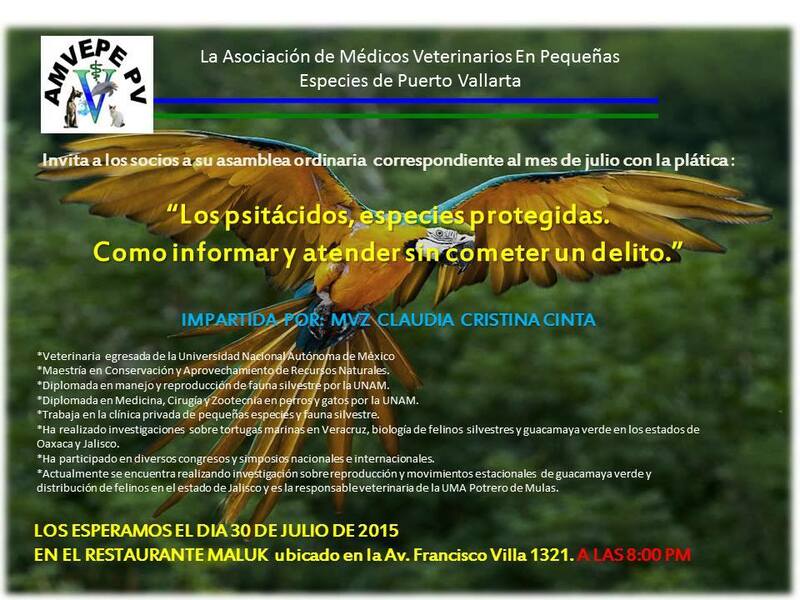 We commit the Association of Specialized Veterinarians of Small species in Puerto Vallarta, to put in their clinics the posters done and donated by Defenders of Wildlife, and the poster done with the Municipality of Puerto Vallarta, so everybody be aware of this situation. We participated on the 3rd. 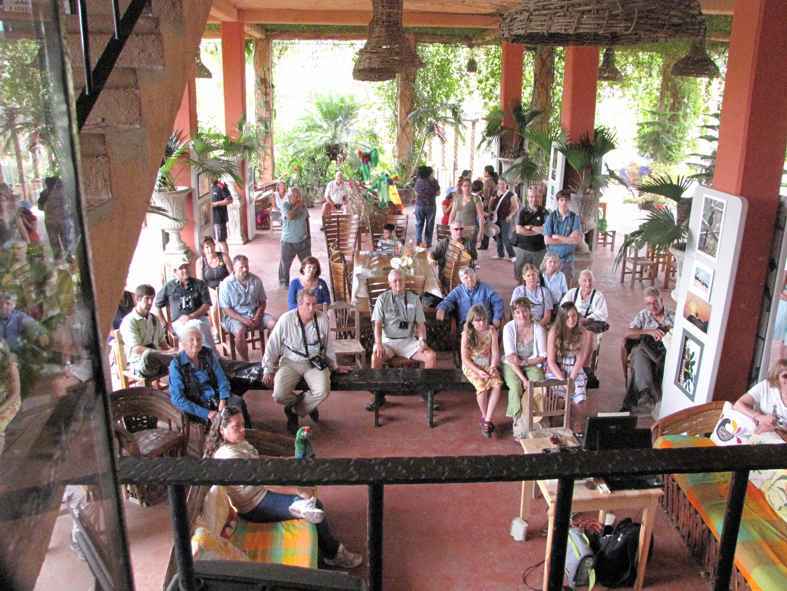 Vallarta Bird Festival from March 6th to March 9th, with activities like ecotourism and a environmental education chat for children in the Natural Protected Area El Salado, in Puerto Valllarta. On March 24th, we participated in the Radio Show called El Foco on C7 Radio Jalisco, with our partners from Punta Mita Foundation and radio speakers hostes of this radio show. 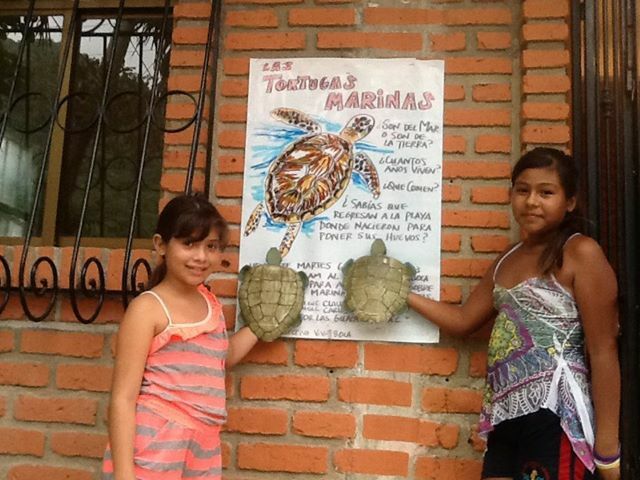 We made promotion of the poster, in collaboration with the Municipality of Puerto Vallarta and Defenders of Wildlife. 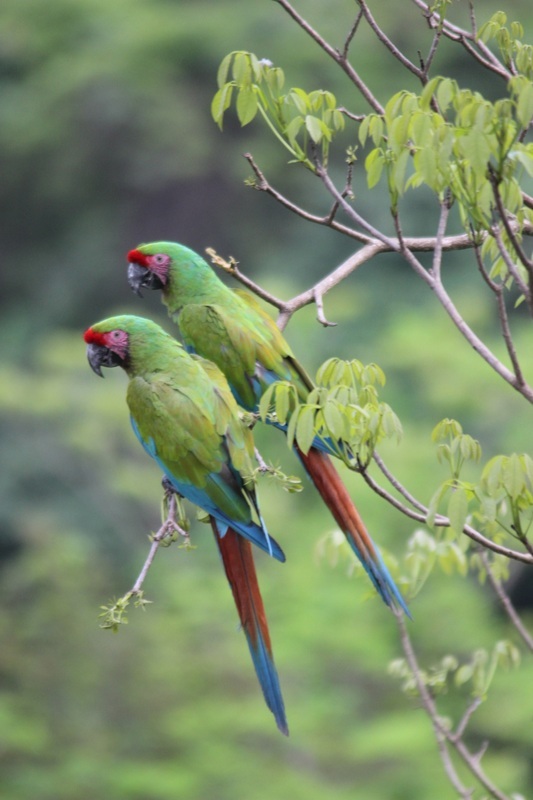 Mortality in parakeets, parrots and macaws for illegal trafficking. 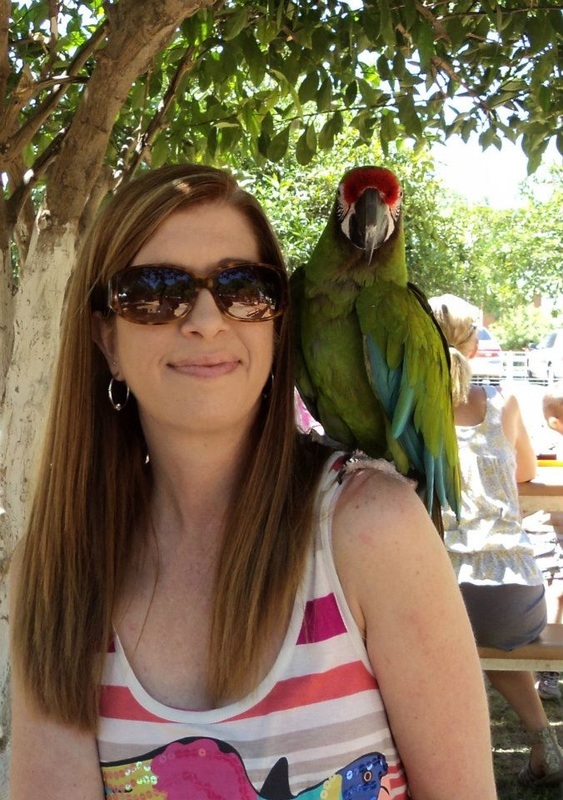 parakeets, parrots and macaws !. ﻿With still low demand on our ecotourism services, but we keep improving and having satisfied costumers. Friends from Denmark came to take the Path of the Military Macaw. Wonderful people and wonderful pictures. 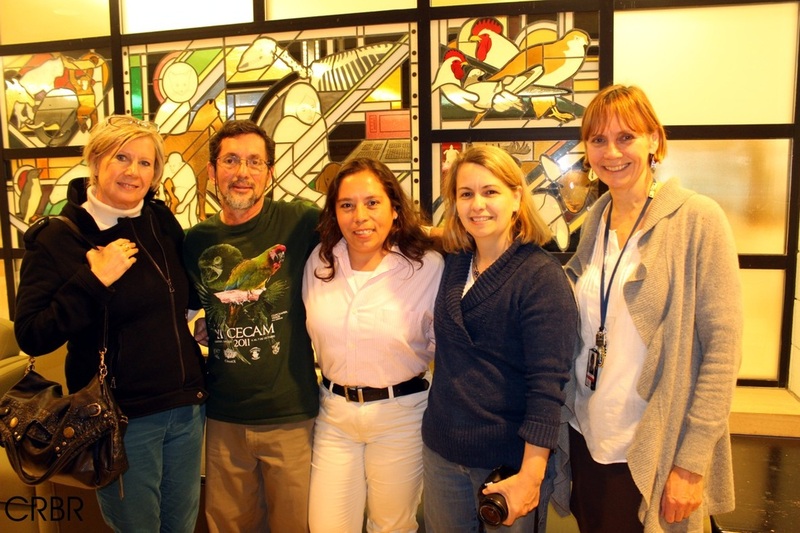 On the tour "One day with the Military macaws" we had Michael Skikne and Neil Kirby and Wendy Cart and Shannon Adams. To whom we gave a recognition for their participation on our tour. 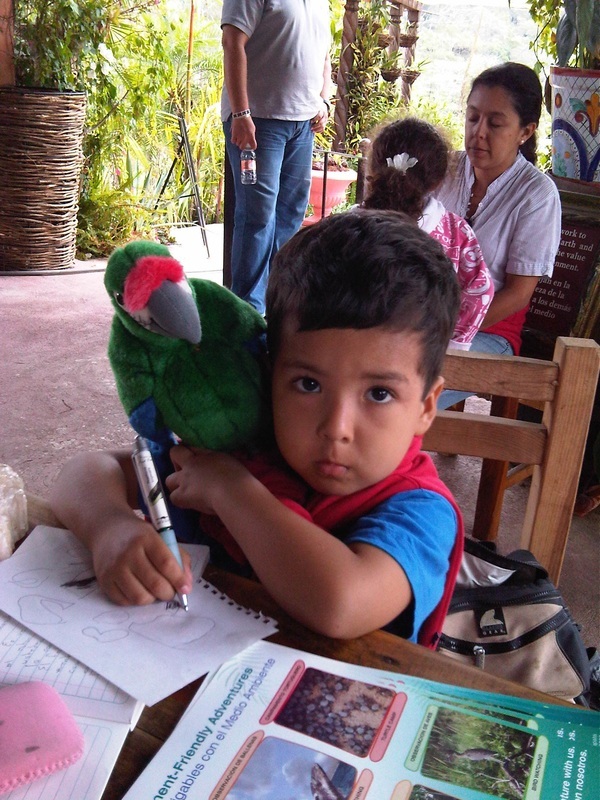 Environmental education is an important issue in the project of Conservations of the Military macaw and their habitats. 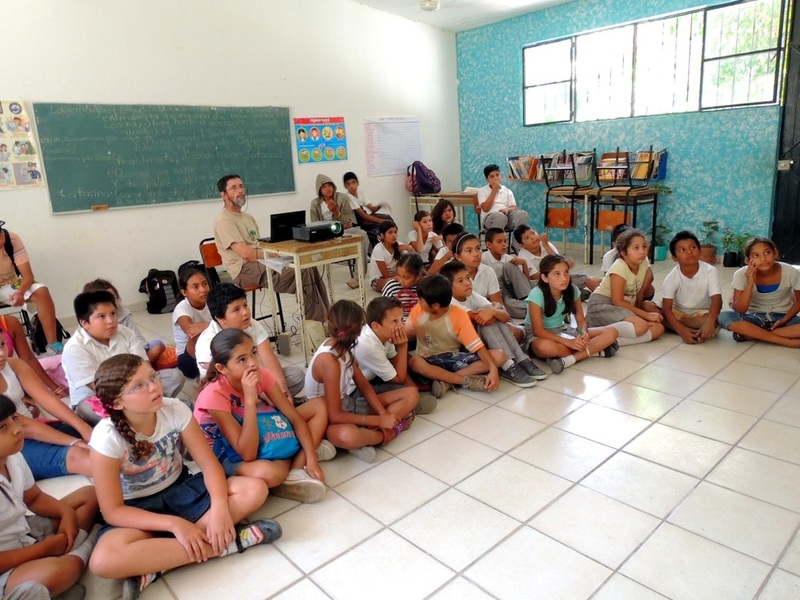 Here an example of our second visit to all the schools in Yelapa. Invited by Colectivo Viva Boca, on Thrusday March 20th, we went to Boca de Tomatlán, to show the children the movie of Rio, we also gave a talk before and after the movie, where we talk about the importance of macaws, no matter which species. That they most live free in the wild, that they are not good pets and that much of what the macaws do to survive in the wild, they learned by their own society living with their flock. 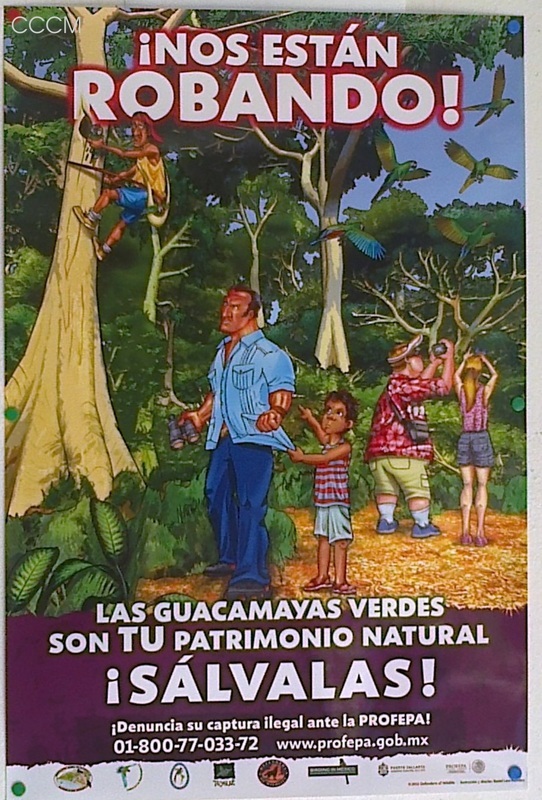 Unidos por las Guacamayas, for second year was invited to be part of the summer camp in Los Mangos Library. Talks, videos, workshops, recreational activities and more. 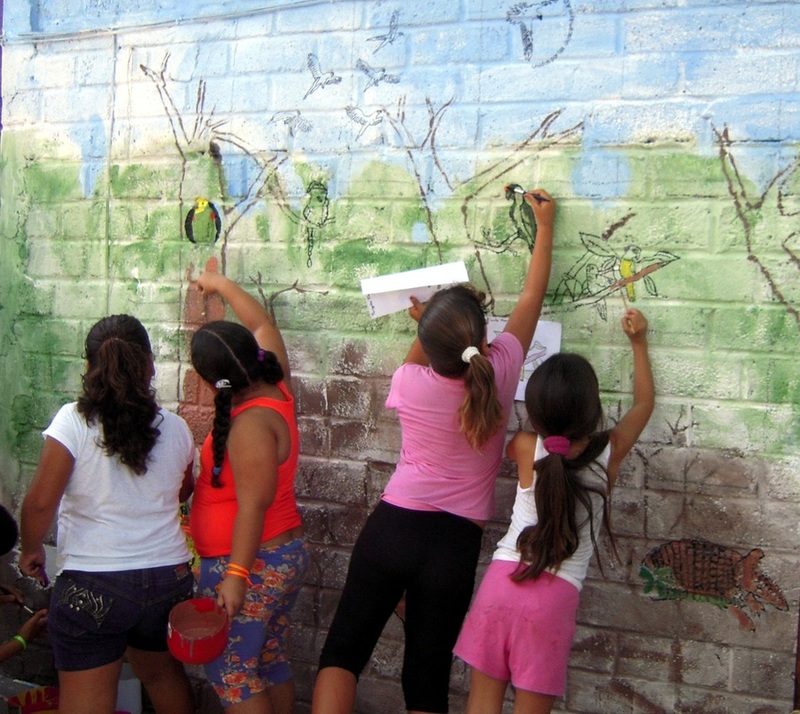 ﻿The children encounter is a camp for children from different communities all around Sinaloa to learn about birds. We also gave a chat about environmental education to students of the University of teachers of Sinaloa. 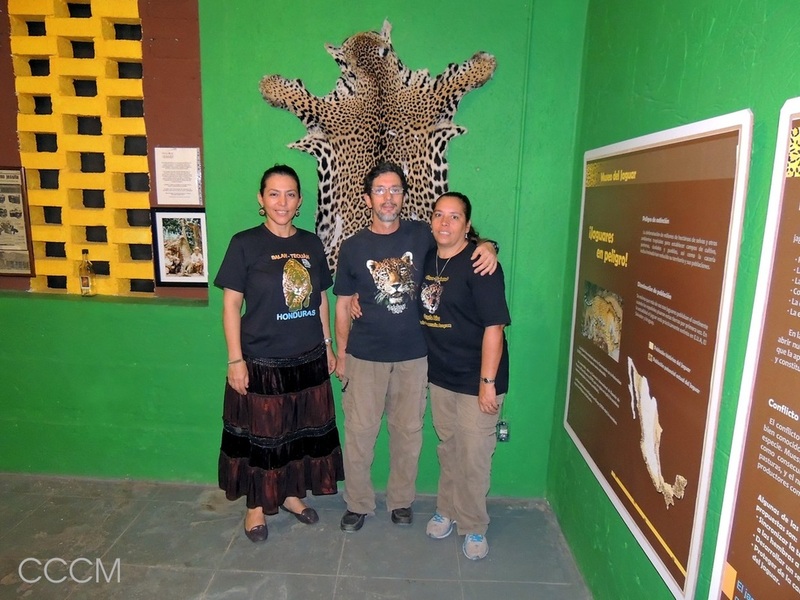 We visited the Jaguar Museum and show our tales about jaguars and the military macaws. Children from Benito Juarez School went to Los mangos Library and we gave them a talk about Military macaws and parrots. 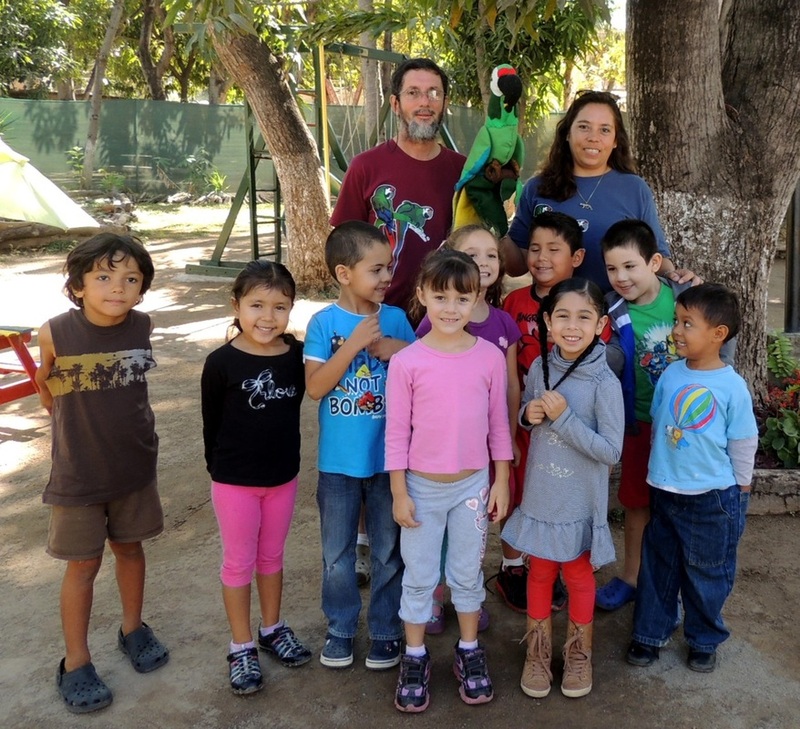 We gave a talk about macaws and parrots to 100 children during the Children encounters in Mazatlan aquarium. ﻿The breeding season ended and with it the studies that became publications and congress presentations, but the most important thing was that with the support of Defenders of wildlife, we were able to protect the biggest reproduction site known for this species. Big part of this couldn´t be possible without the participation of our two field guides that made a huge surveillance effort to protect the nest. Thank you Manuel de Jesus Rodriguez and Javier Sosa! Since this month, we collaborate in the project “Conservation of the Military Macaw in Mexico, strengthening research groups” in coordination with the Autonomous Pedagogic University of the State of Sinaloa and the University of Saint Nicolas de Hidalgo from the State of Michoacan. Unidos por las Guacamayas proud hostess of the reunion of experts about Military Macaws (Ara militaris) and also for the workshop about monitoring, participation and environmental education. 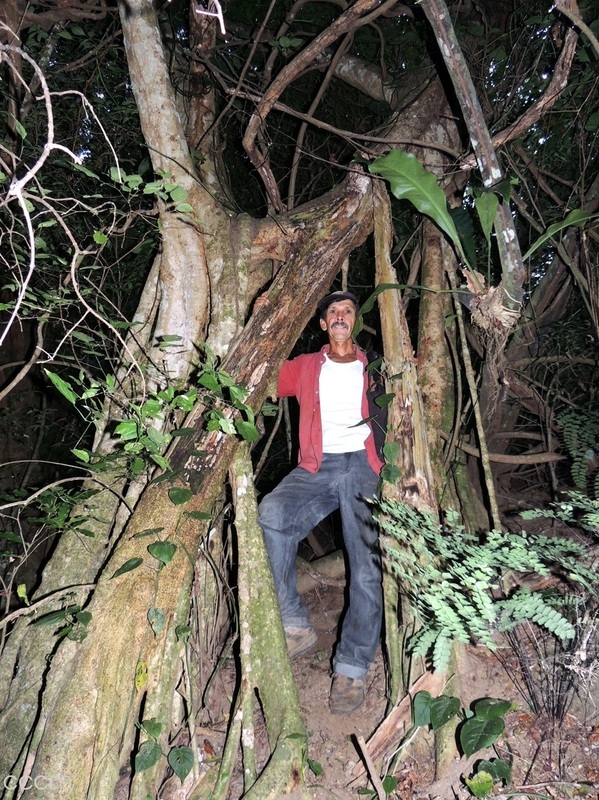 Gregarius nesting of the Military macaw (Ara militaris) in a tropical coast forest, Occidental, México. 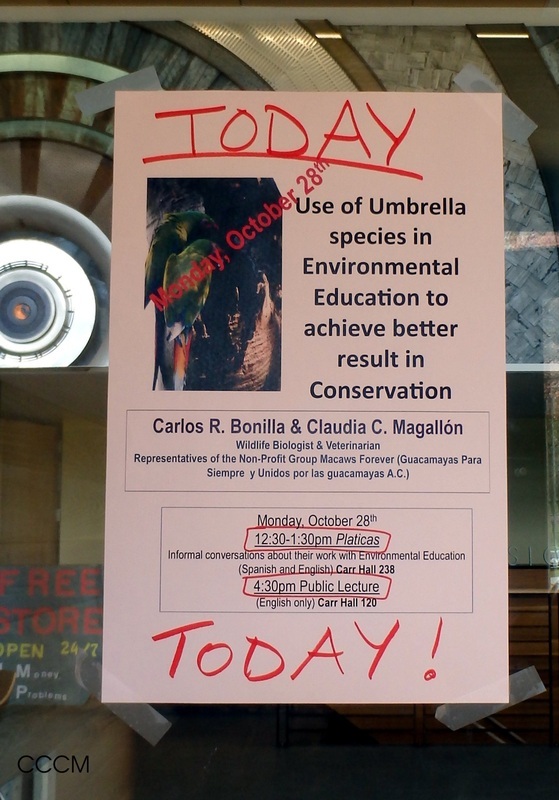 The use of umbrella species in environmental education to achieve better results in conservation. Also, the reproduction season started on this month, and we monitor for the first time with a camera inside a nest and kept the surveillance of the reproduction sites with the help of our local guides and the economical support of Defenders of Wildlife. 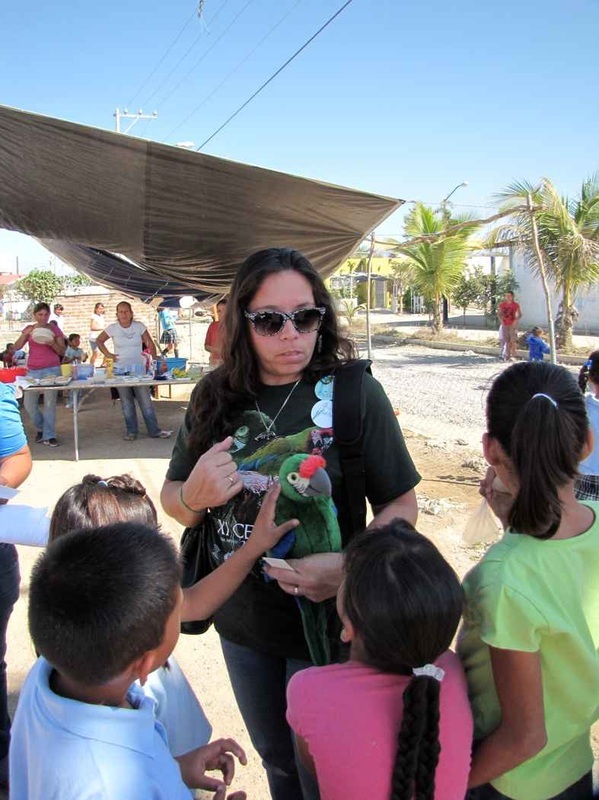 We´re very proud of the goals reached this year, thanks to the donations during 2013 and the team work with the University of Michoacan of Saint Nicolas de Hidalgo and The Pedagogic University of the State of Sinaloa, in the Conservation project of the Military Macaw in Mexico. and the little cottages of Cheryl Harleston in Yelapa town. From all of us to all of you, Thanks, Thanks so much! ﻿...We haven´t been able to update our web page as much as often as we would like. In the next paragraphs is what we have done in the last 6 months of 2013, in one of each of the different activities we do. 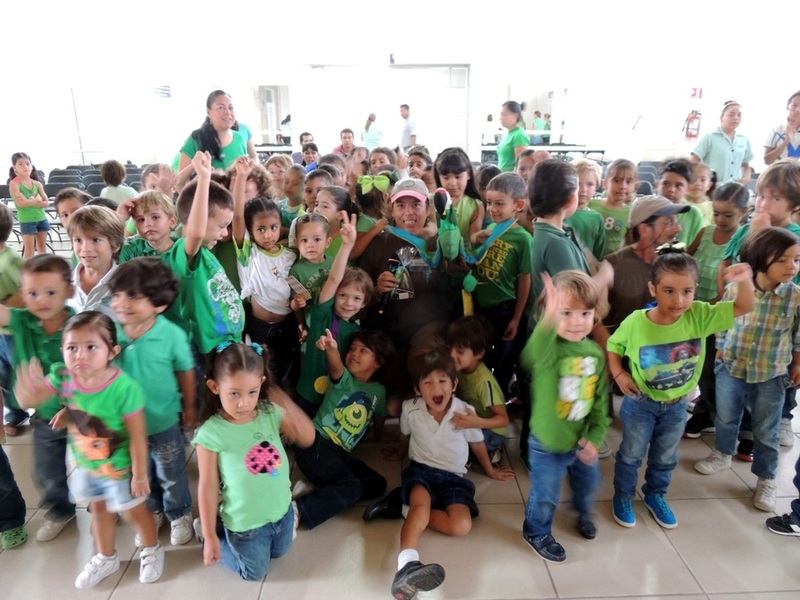 In the community of Punta the Mita, with the support of Serendipity Restaurant, we did for the children a rally to promote the importance of studing as a way of personal development and social confort, and also spread the love for nature and the values of conservation. As a result of this really the children did a mural at the restaurant to remember this activities and every child leave there their signature. 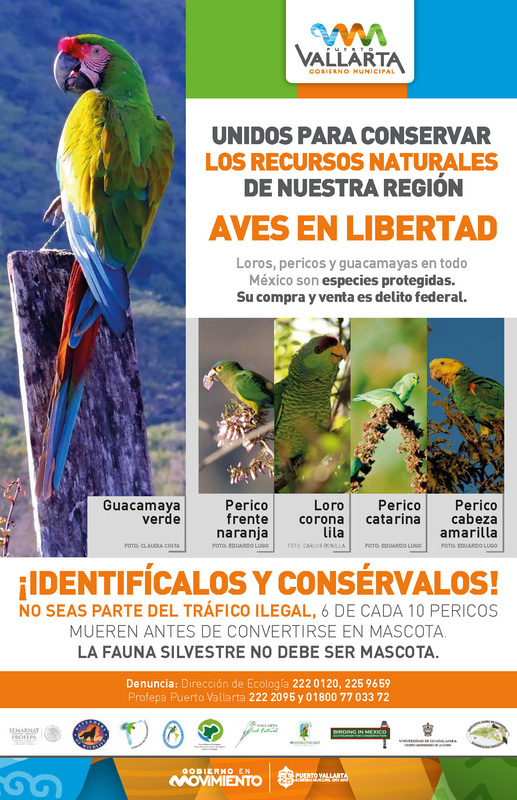 Besides the Municipality of Puerto Vallarta and throw the campain against ilegal animal traffic of parrots and macaws in the región, we have been supported by Defenders of Wildlife Mexico with 3 different posters that shows that traffic of parrots and macaws is ilegal and has been distributed all around the región. We have been visiting schools from Kinder garden to High school in Puerto Vallarta and Yelapa and also social assistant institutions like Fundación Boca in Boca de Tomatlán, Jal. And the Municipal Library of Puerto Vallarta, Los Mangos. The issues of the presentations has been extended to make conscious about the importance of preserve the habitats to preserve the ecological biodiversity and the benefits that this may bring. We have done presentations about bats, sea turtles and the feeding chain. We did a Environmental workshop for children as part of the Summer camp organized by Los Mangos Library. With the support of our friends in Cleverland (Norman and Carol Weinberg), in Pennsylvania (Liz Olson) and in Ontario, Ca. (Jennifer Weber). We were invited to promote our conservation program of Military macaws in Bahia de Banderas, in the Metropark Cleveland Zoo (Dr. Albert Lewandowsky), the Natural Histoy Museum of Cleveland (Harvey Webster ), Allegheny College (PhD Liz Olson), the Veterinary Faculty of the University of Guelph (Dr. Dale Smith and Natalie Lemieux ) and the Visitor Center in the National Algonquin Park in Ontario, Canada (Dawn Sherman). Thank you so much for the invitation and for giving us the chance to show our work!!! This second semester of the year with the economical support of Defenders of Wildlife Mexico we were able to protect an important nesting area of the Military macaw, one of the biggest that has been studied until now. We still have the support of some touristic servers for our field work in far away places, they give us lodging for free. With the support of Defenders of Wildlife Mexico we were able to involve local people to protect an important nesting area of the Military macaw. 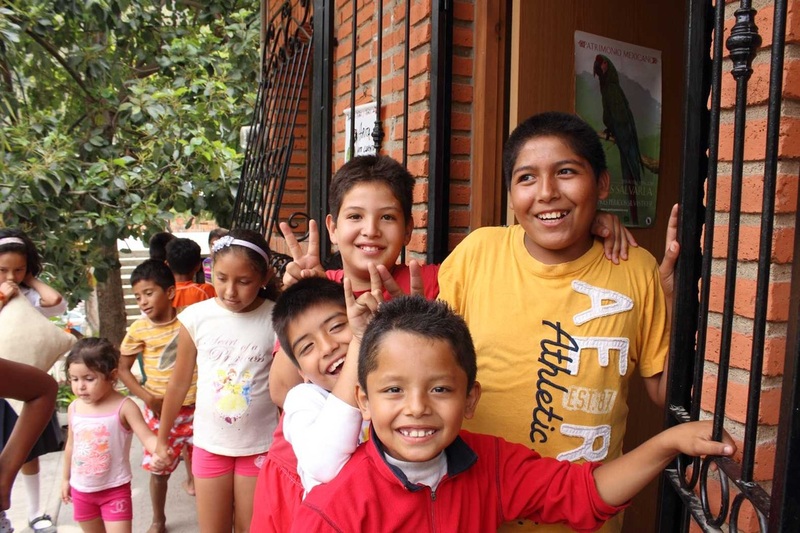 With the support and enthusiastic feelings of organizations like * Viva Boca, in the community of Boca de Tomatlan, which looks to get closer to the people to improve their quality of life. We achive to involve with the activities of environmental education they have been doing to make more conscious about ecology to many people in the community. Thank you Colectivo Viva Boca!!!!! The next list show all the 2013 donors that make possible the work we´re doing this 2014. THANK YOU TO YOU ALL!!!!!!!!!!!! There been so much work!!! 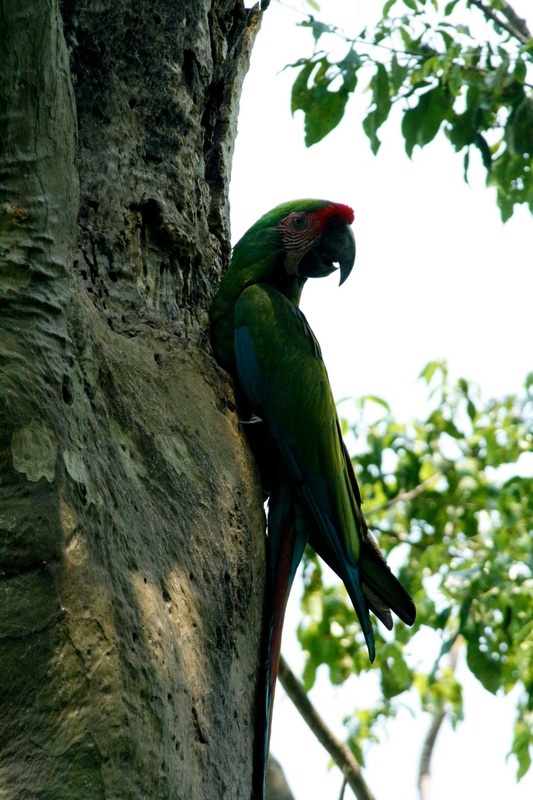 In coordination with the University Michoacana of Saint Nicolas Hidalgo, we start a study of the reproductive behavior of one of the populations of Military macaw on the region, and we continue with the monthly monitoring of the populations in three different places, in the municipalities of Puerto Vallarta and Cabo Corrientes. We´re tracking the reproductive behavior, that haven't been observed before, we´re achieving the biggest counts populations ever registered. With this data we´re writing two scientific articles, as results of our work in the field. 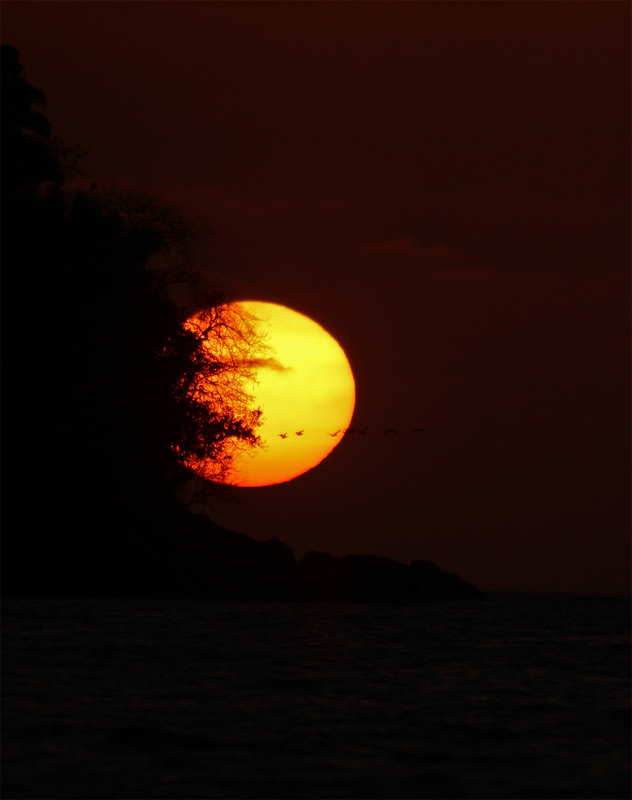 We´re also starting a monitoring of the biodiversity of terrestrial mammals that share the territories with the macaws. 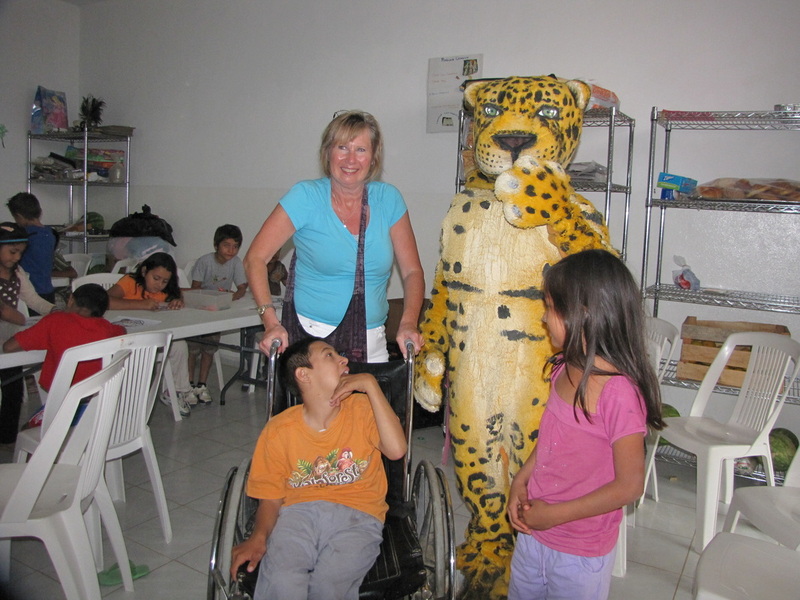 We have visit a lot of schools from pre-elementary, junior high and high school in Puerto Vallarta and Yelapa, and also social assistance institutions like an orphans house, the Boca Foundation in Boca de Tomatlán, people with visual disabilities of the Bay and the Library Los Mangos. 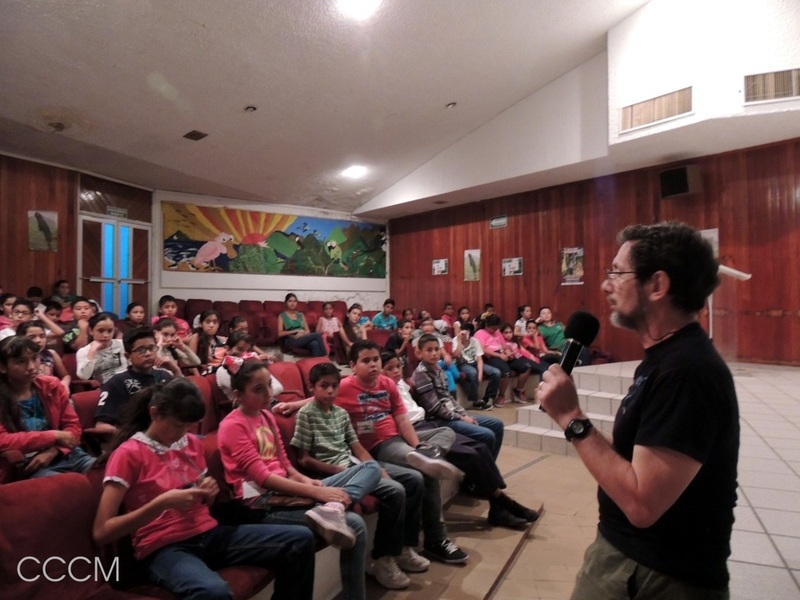 In this way we were able to give the message of conservation to more than 600 students and adults of the region. 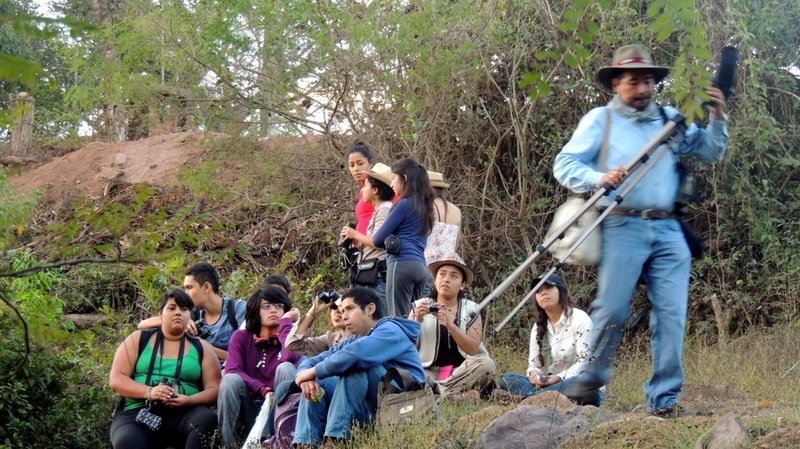 We got the visit of a group of students of Biology, we show them the natural resources beauties and how the program of Military macaw conservation try to protect them for the benefit of the biodiversity of the region and the human society that lives with it. We have also produced some videos to promote the work of the association that can be seen in our Video Gallery. 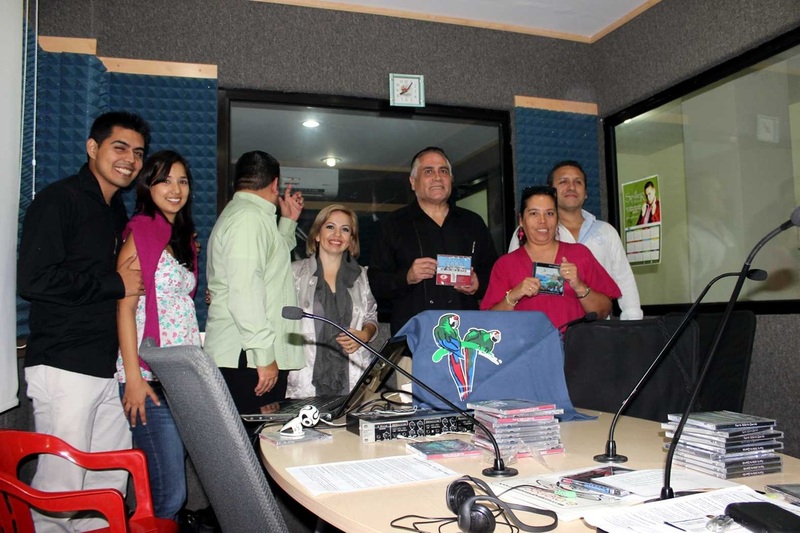 We´ve had been in two radio programs taking about the conservation of the military macaw on the first days of the year. 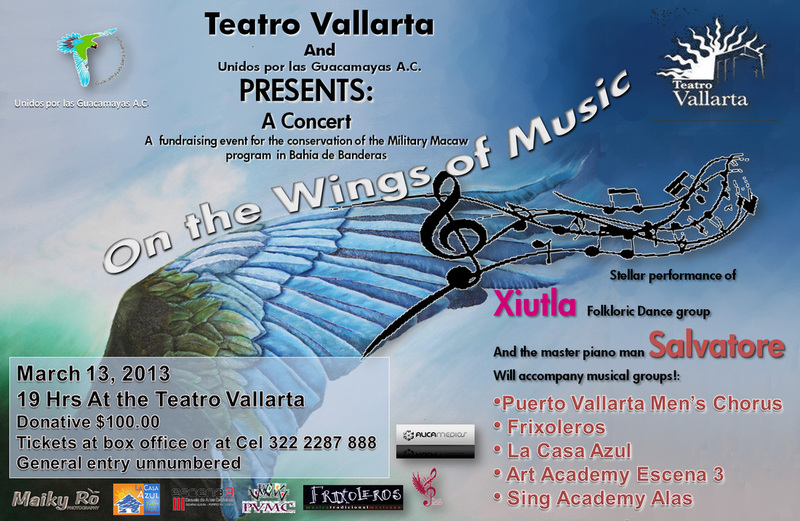 With the support of many friends we organized a concert to reach funds for the Military macaw program in Bandera´s bay. In the concert we got the participation of kinder children, folclorical musicians, a wonderful pianist, a singing school that impress us and touch our hearts with their performance, and the men´s choir of Puerto Vallarta. We have an home office of 300 persons. Thanks to all! 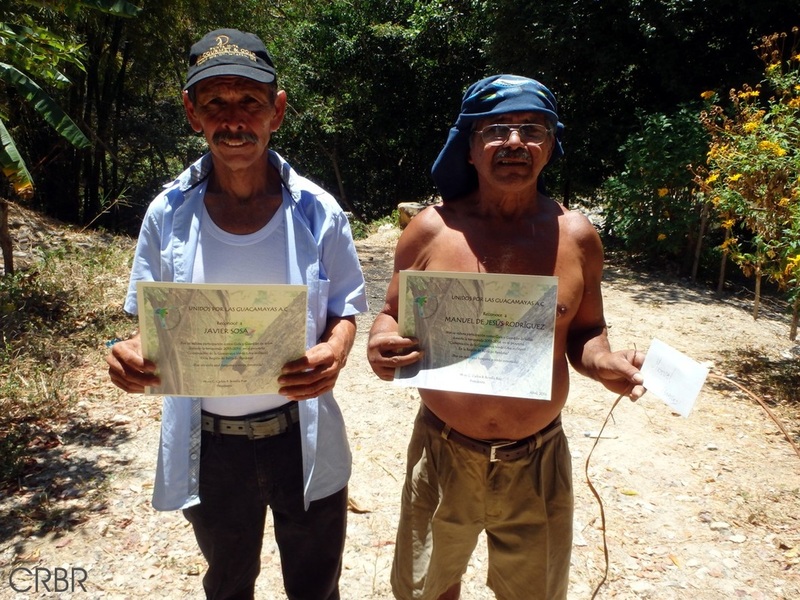 With the financial support of Bandera´s bay Initiative A.C. it has been started a project of improving the habitat. 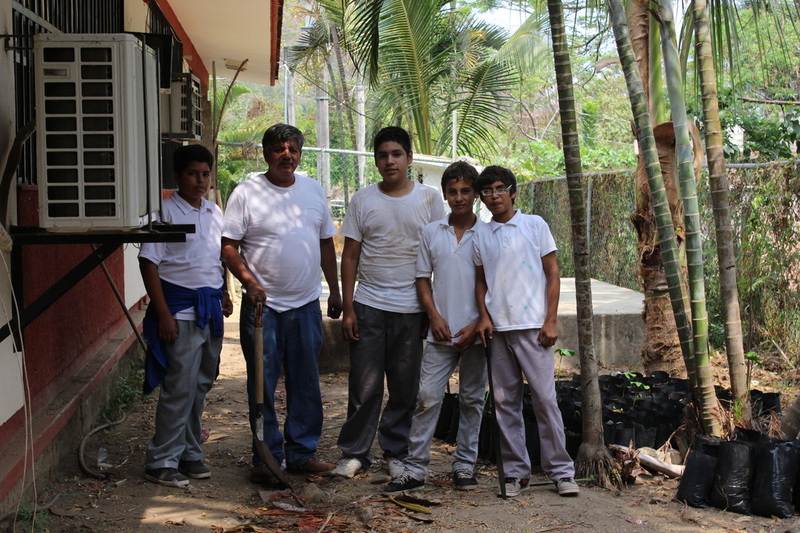 With the participation of the Principal of the Junior High Leona Vicario of Boca de Tomatlan and their students, if has start the construction of a nursery that will have around 1000 tropical trees, that are useful for tropical wood, but also very useful for the feeding and nesting areas of the Military macaws. 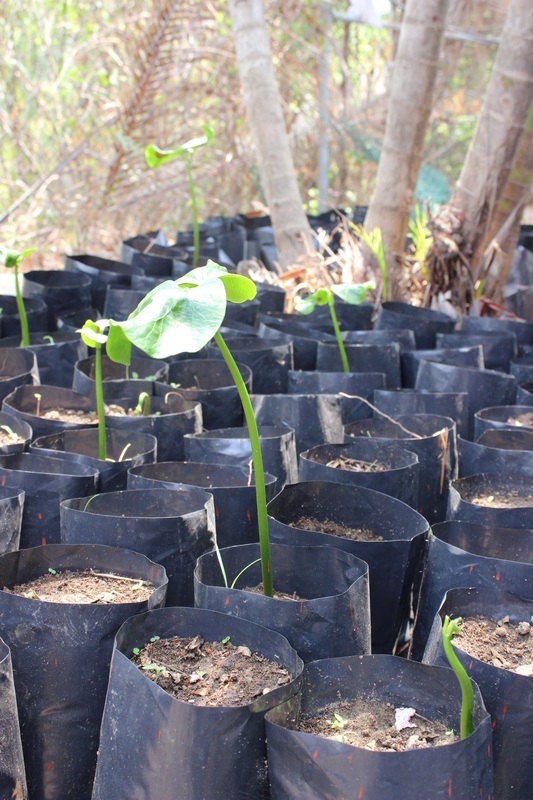 We already have the first plants, Thanks to Bandera´s Bay initiative! 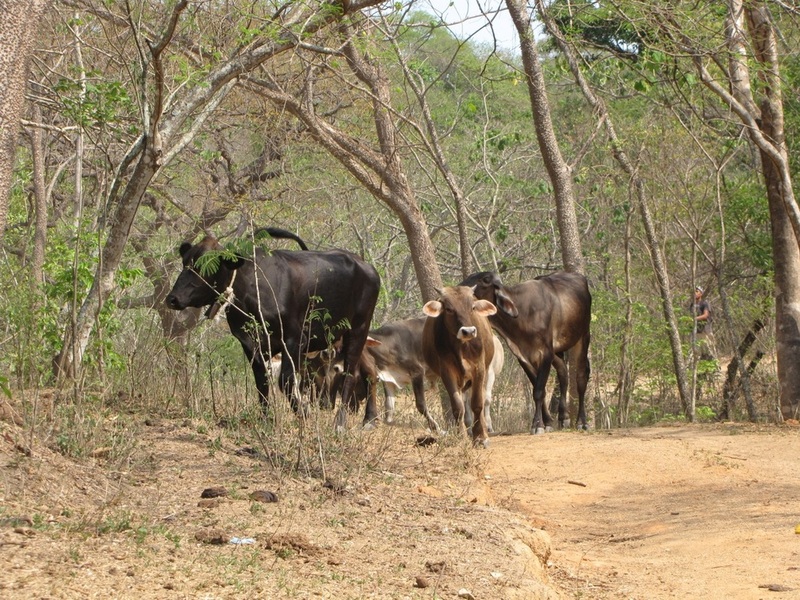 We have supported landowners with wildlife troubles, as there has been some jaguar attacks to the cattle. The jaguar is a endangered species that share the territories with the Military macaws, the protection of this species is closely attach to the management of the land that men do and the use of the natural resources that animals do. Military macaws Project has been recipient of important supports from Suzan Payne and Jennifer Weber with economical and material items that help us to reach the goals of the next year and made the field work more comfortable. 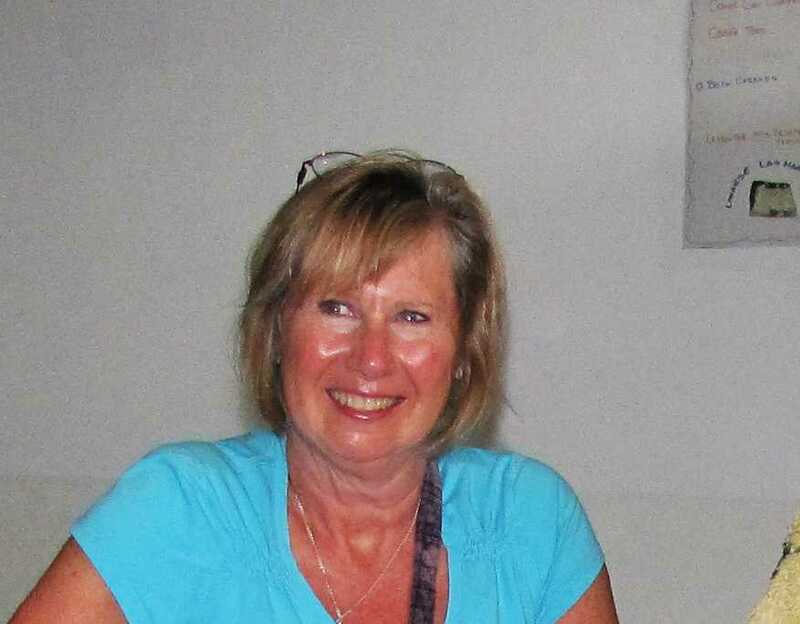 From Amber Lynn Puckett, Mary Rose of Central Chirping and from Arlene Powers their unconditional and disinterested support in the realization of the raffle of a beautiful paint of Chula, Art piece of Arlene Powers to benefit the Conservation program. Gyula Gulyas also donate a software useful for the field data obtain in the field biological research of the Military macaw. Thank you Gyula Gulyas! We are very fortunate, Thanks! Both places are paradisiacal, if you seek beautiful places for rest and relaxation DON'T MISS THEM!! We want to thank those who in one way or another, has supported us in the past year (2012) to do the things we are reporting on this page. 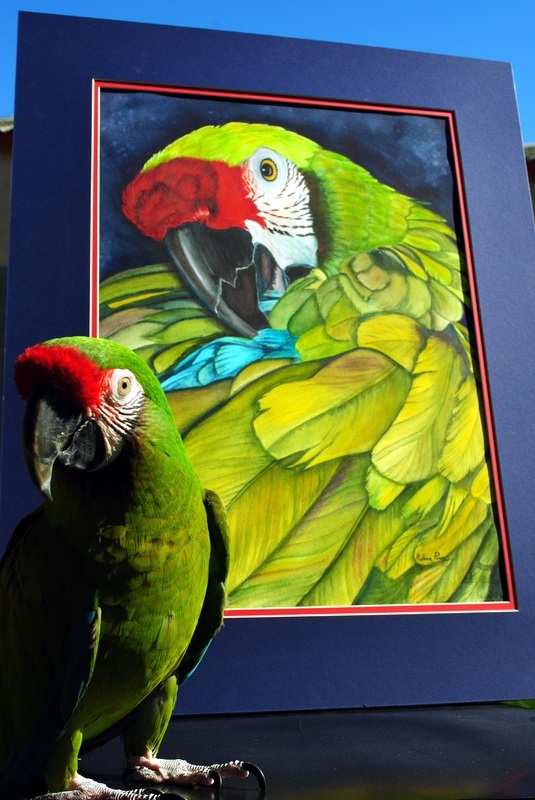 Special thanks to the Golden Triangle Parrot Club, and Canadian Parrot Conference, which in 2011 decided to support with its "Pennies 4 Parrots" campaign. A further thanks to Dr. Tiberio Monterrubio Rico of the University Michoacana de San Nicolas de Hidalgo, who invited us, to participate in a major project of conservation of these beautiful birds. It is a pretty big population! We participate in the XVI Congress of the Mesoamerican Society for Biology and Conservation in Panama City, presenting a paper on the Military Macaw in Puerto Vallarta, as well as in the discussion forums on the action plans for the conservation of parrots in Mesoamerica. 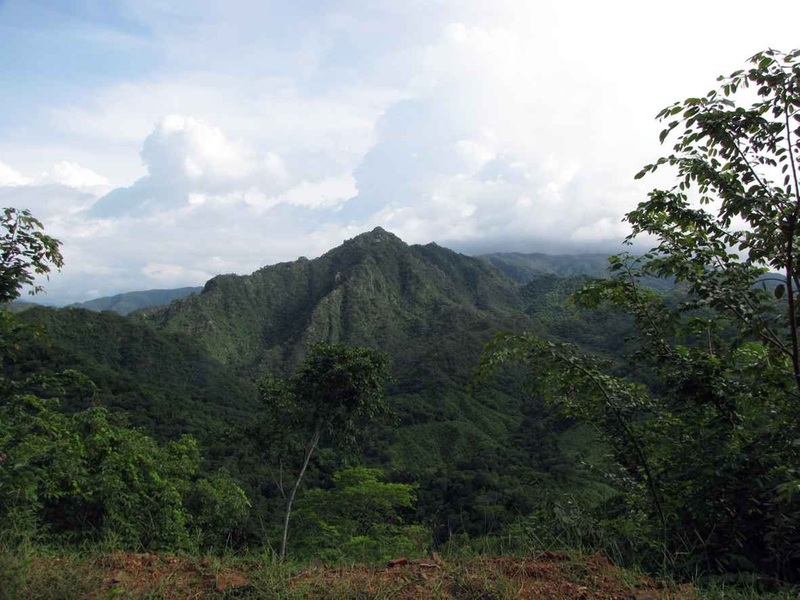 We have initiated collaboration on the Military Macaw National project. 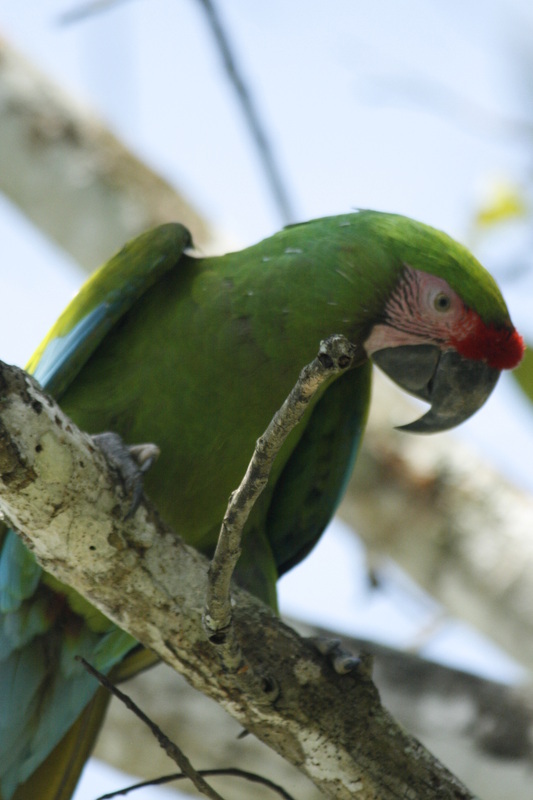 this project seeks to define the important sites for conservation of the Military Macaw in Mexico, and we're already monitoring a breeding area south of Puerto Vallarta. This is the description of the work art. July 12th. We participate in the forum of the National Tree Day. 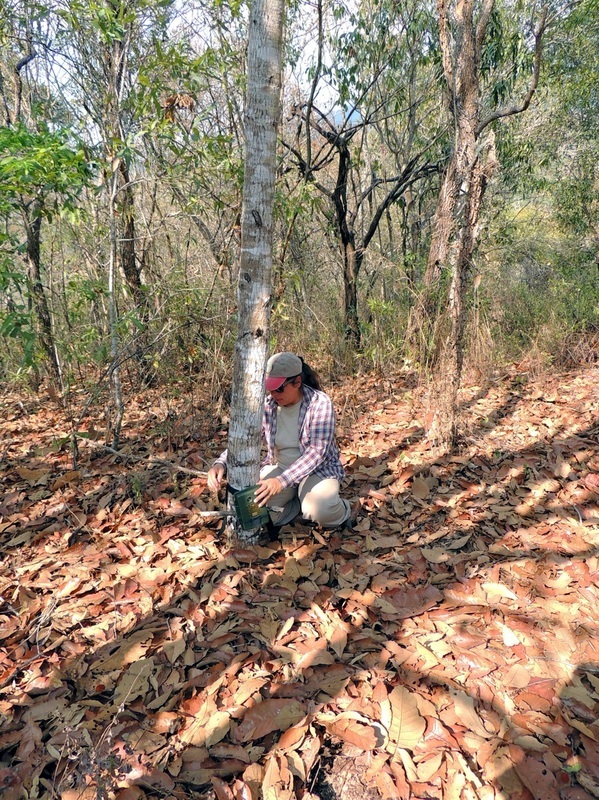 It was held at the Centro Universitario de la Costa, revealing the importance that trees have on the development of ecosystems and their biota. We have developed new educational material that talks about the importance of trees and their coevolution with animals, this audiovisual material is called "The trees-forest". June 5th. We participated in the event of the day of the Environment in the Natural Protected Area Estero Salado, publishing he activities of the Macaw conservation program in Bahia de Banderas. June 6th. We participated in the seminarian during the Environmental day celebration on the Centro Universitario de la Costa with a chat about Military macaws. June 18th-27th June. 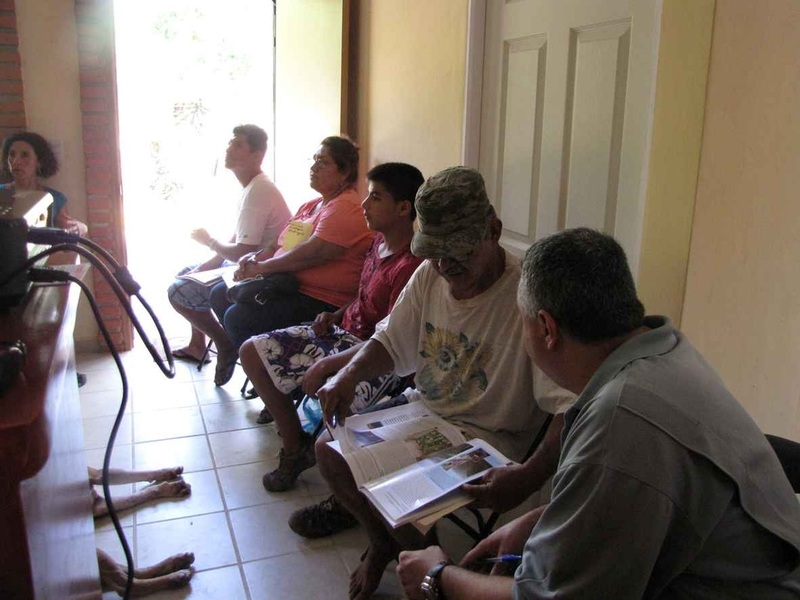 With the participation of people from the communities of Boca de Tomatlan and Bioto, a workshop on ecotourism and hiking was given. 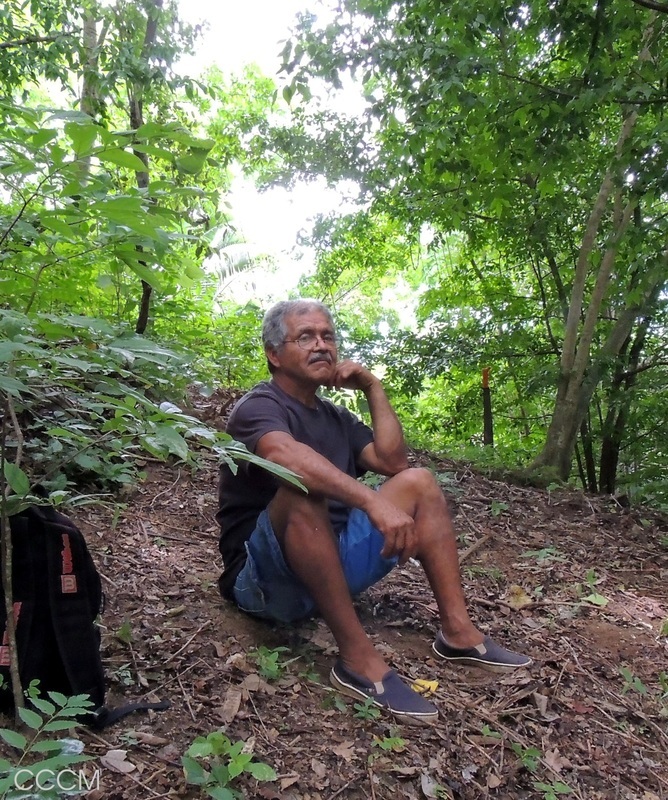 As a result, participants raised two projects developed with support from Guacamayas forever and start working to achieve them in the coming months. Soon, we will hear from them. To Jennifer Weber, as our representative in Canada. Thanks for your enthusiastic collaboration! 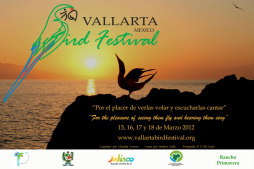 In Vallarta Bird Festival which took place from March 15thto 18th we participated with a talk and the presentation of the story. Arita …A tale of macaws we show it in both languages in English for an adult audience and in Spanish for children who attend the Festival. We appreciate the invitation. 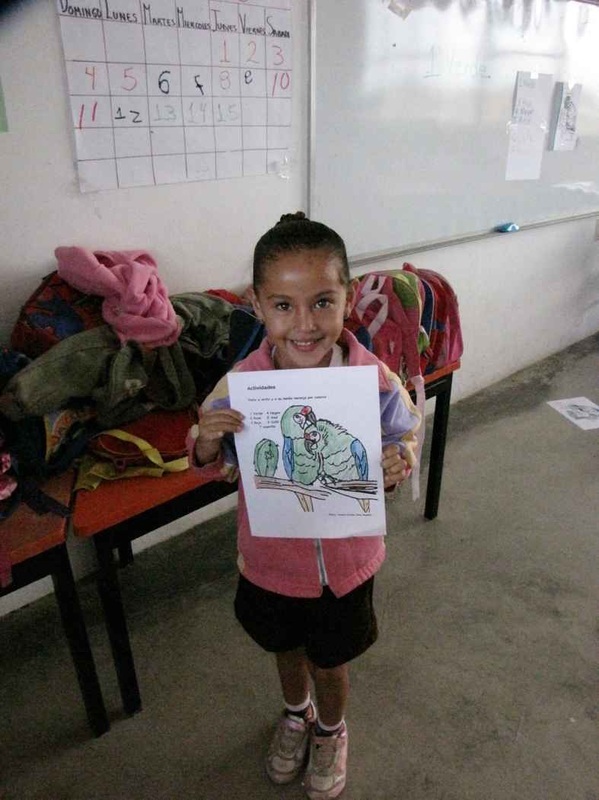 We presented the story "Tuwe, the guardian of the Forest" In the Home "Manos de Amor por Bahía" in Bucerias, Nayarit. 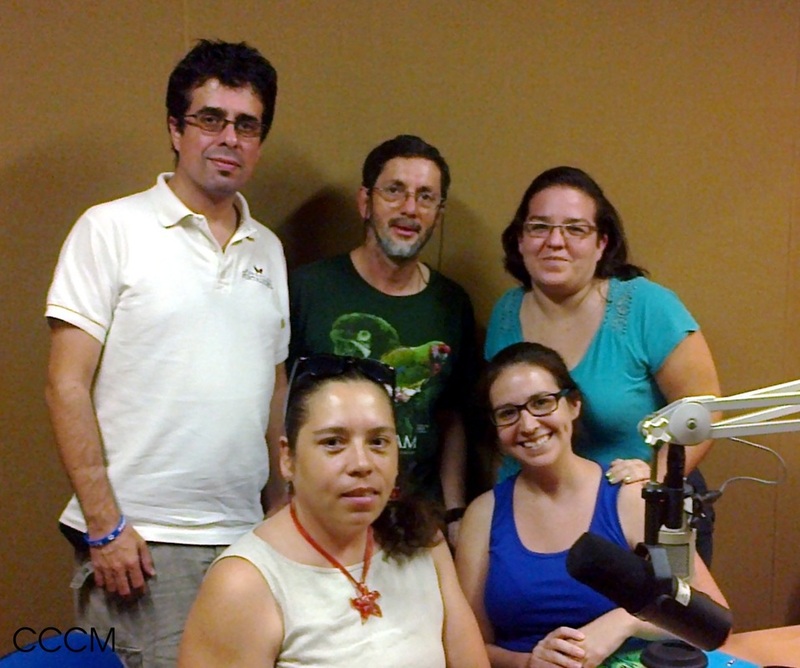 The mangrove El Salado invited us to its radio show "Estero fonico" where we talked about the importance of the Military Macaw, their habitats and their presence in certain time of year in the vicinity of the mangrove. We appreciate their invitation. 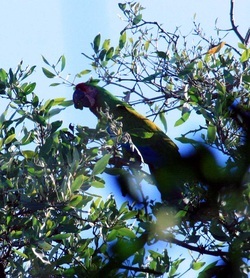 It has been done exploring research to one of the nests found in Las Juntas y los Veranos and we have begun monitoring the population size of a Military Macaw populations in the region. We are working in parthenship with the Xaman Ha Aviary, located in Quintana Roo, Mexico, describing useful indicators for the conservation of Macaws. 2012….With renewed energy we began the year, returning to work. Hamilton Parrot Club Carlos Bonilla was interviewed. enthusiastically welcomed the proposal. In the name of all the ones who participates in Macaws Forever want to say: THANK YOU VERY MUCH! This year the Canadian Parrot Club and Parrots International choose our Project to be distinguish with their campain “Pennies 4 Parrots, 2011”, the benefits will be given during the Canadian Parrot Conference on November. 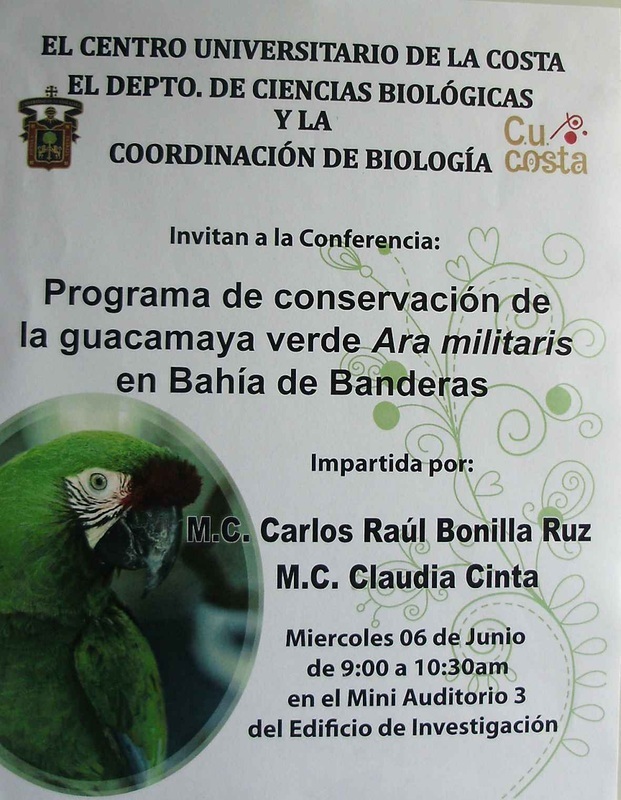 This honor encourage us to continue working on the conservation of the Military macaws in Bandera´s bay, is also a good support for our next year efforts with least concearn about resourses. We have located 10 macaw nests in 2009- 2010. These, according to our estimates and studies performed on this species, correspond to a population of about 100 individuals. 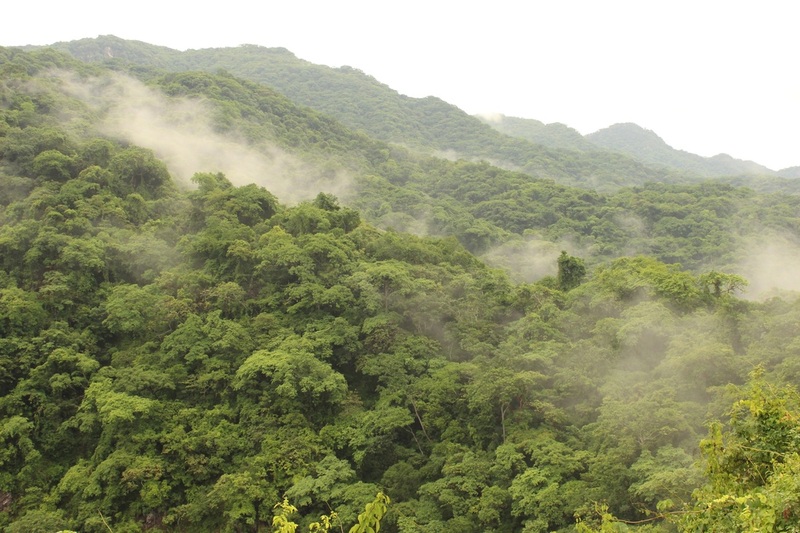 According to our monitoring and research, the largest populations are El Jorullo – Paso Ancho and Boca de Tomatlán – Yelapa, with aprox. 100 individuals each. 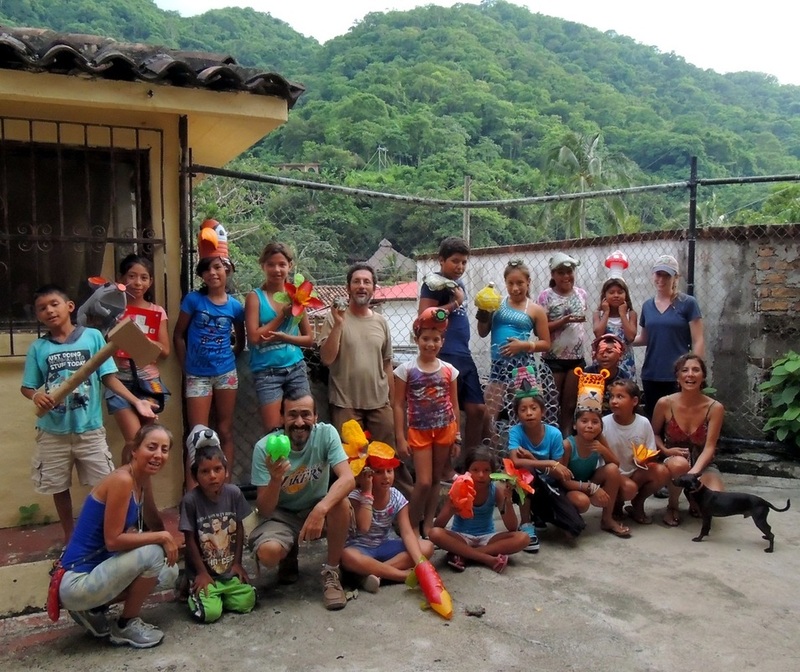 We have visited schools and kinder in Yelapa, organizing a little workshop on the importance of the macaws and their conservation in the Bay of Banderas. On basis of our work in Boca de Tomatlan a small group of students formes a group of surveyors, monitoring the Boca de Tomatlán- Quimixto- Yelapa areas. 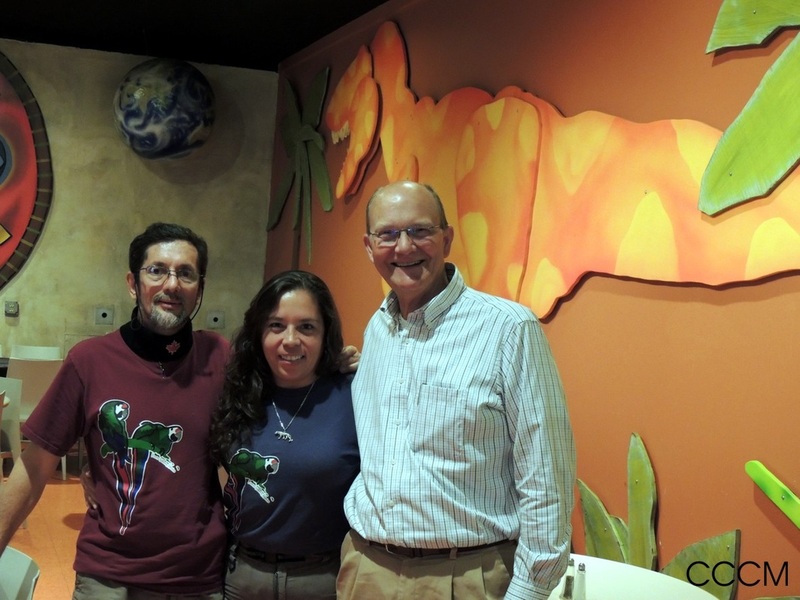 Macaws Forever receives a recognition from the CONANP during a conservation expo.